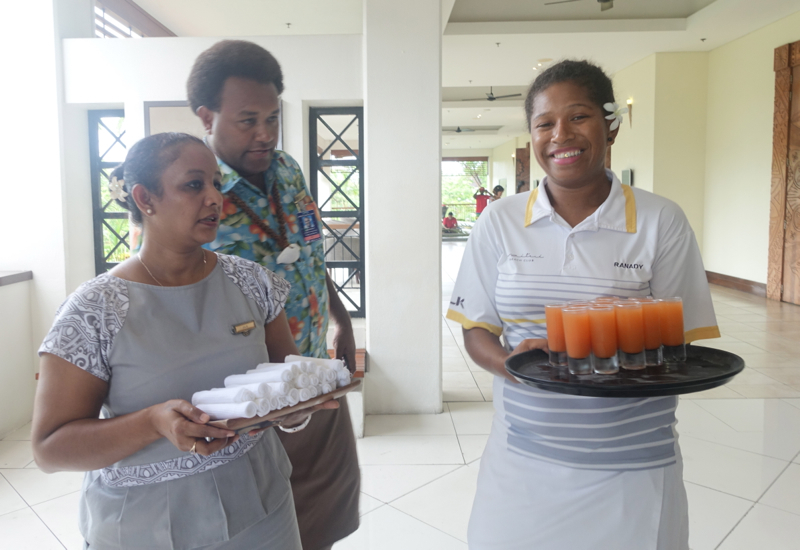 The Sofitel Fiji Resort & Spa is located on Denarau Island, 12 miles and about a 20-25 minute drive from Nadi Airport. Official taxis are easy to get at Nadi Airport (assuming there's not a major weather event) and our ride cost about the equivalent of USD $15. 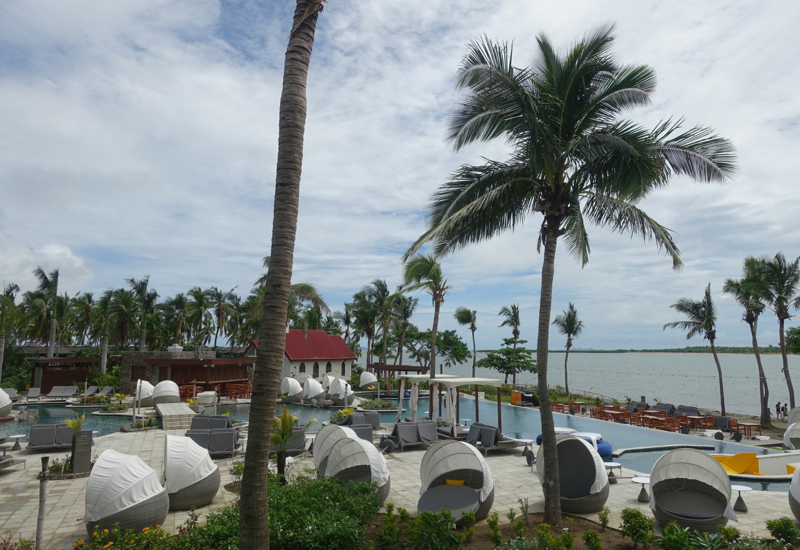 We were in an Opera Suite and were invited to a private check-in area for guests staying in rooms and suites with Waitui Beach Club access, although the check-in process was extremely slow. 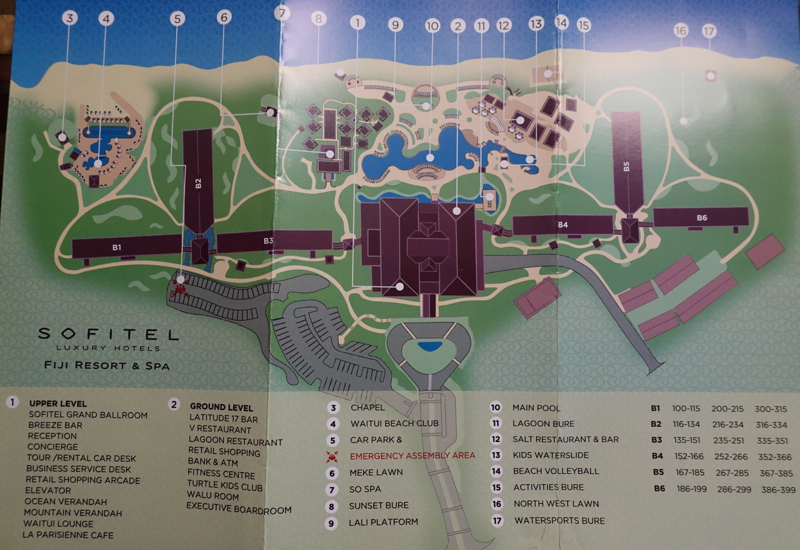 While we did arrive before the usual 3pm check-in time, it would have been nice to have been invited to use the spa showers to freshen up, but instead we were simply given a complimentary drink voucher and told we could have lunch and come back, or to wait in the lobby. Fortunately they did try to expedite the cleaning of our suite, so we waited about 40 minutes and were able to check in ahead of the regular 3pm check-in time. 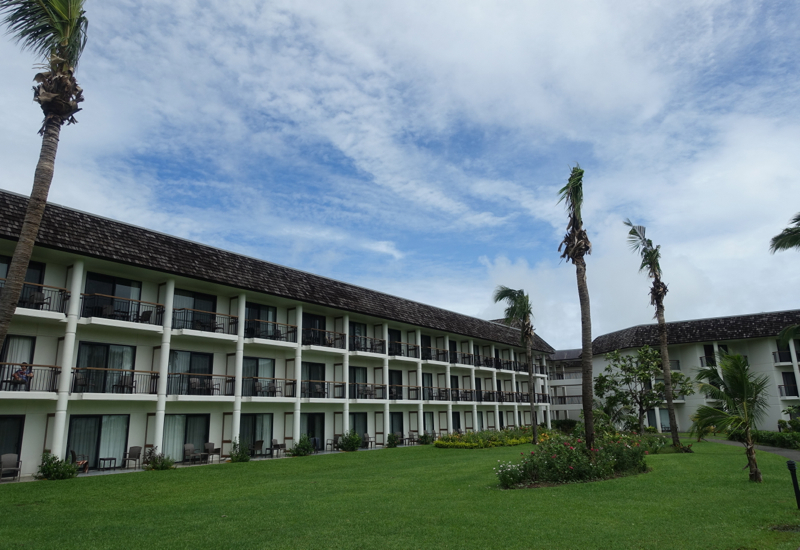 The resort is quite large, with nearly 300 rooms and suites, 3 restaurants, a kids' club, adults-only Waitui Beach Club and pool, the main pool, and So Spa. 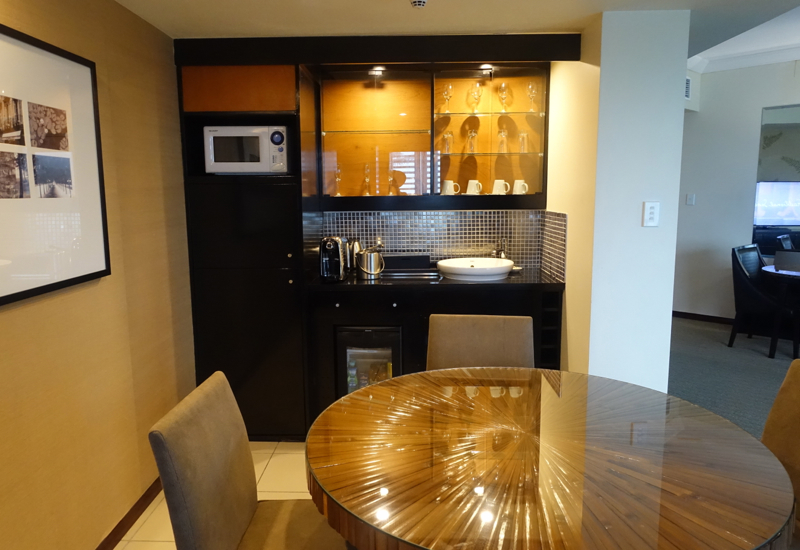 Once our Opera Suite had been cleaned and was finally ready for check-in, we made our way to it. 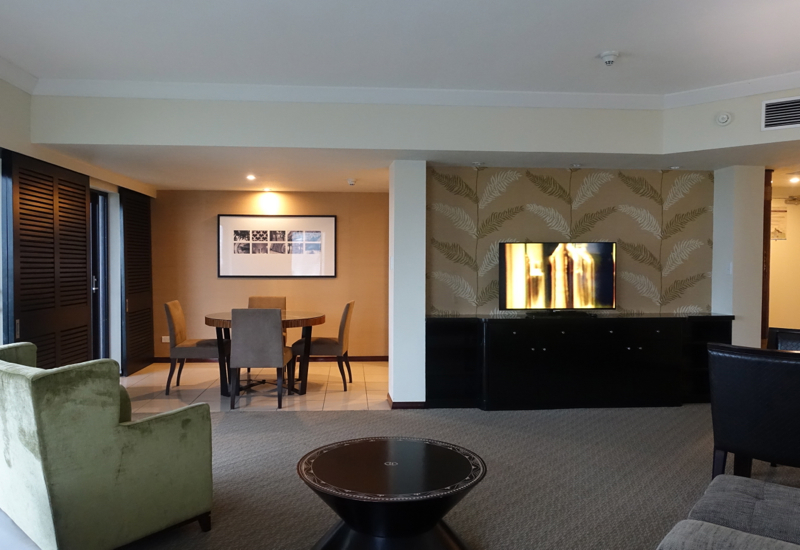 Opera Suites are 904 square feet and include access to the Waitui Beach Club, although during our visit, due to the storm, the Beach Club was closed the entire time. Here's the Opera Suite living room area, which is also where the resort placed the extra bed for our son. The bedroom has wooden doors that close it to the living room, and features a King size bed. 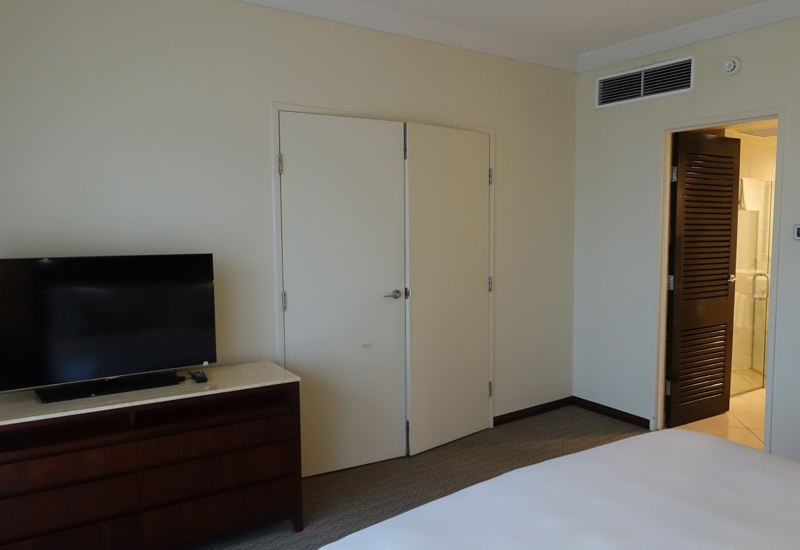 While the resort itself was built in 2005 and last renovated in 2012, the suite including the bedroom was very plain. 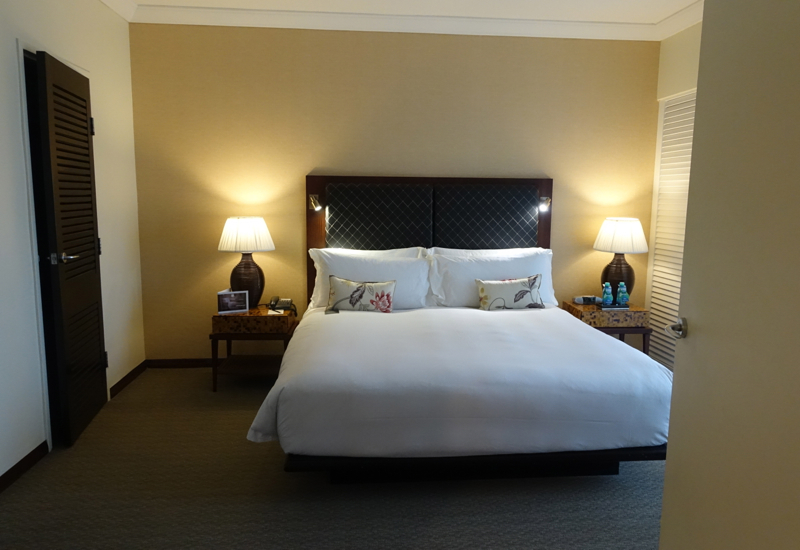 The king bed itself, however, was very comfortable–that's something that Sofitel manages to excel at, even in more basic Sofitels such as this one. 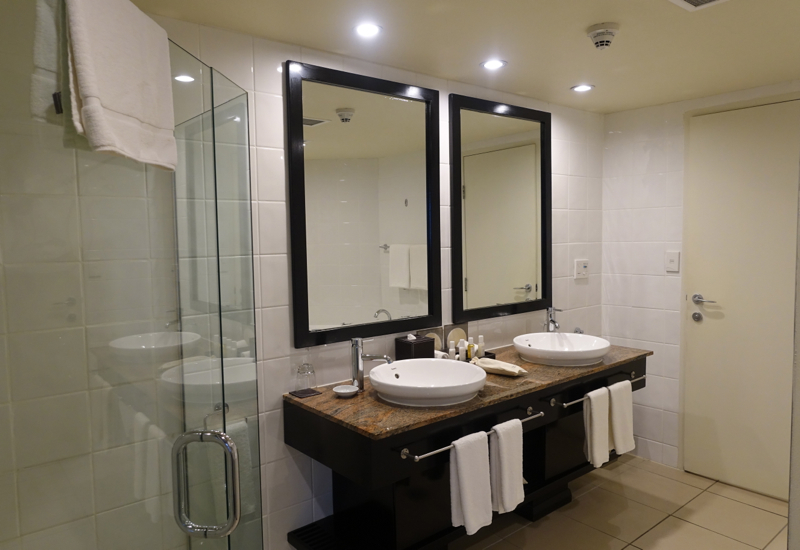 The bathroom had double his and hers sinks, separate toilet chamber, a walk-in shower (although unfortunately the design was such that if you showered too long, the water seeped out of the shower and onto the bathroom floor) and a jacuzzi bath that we loved. 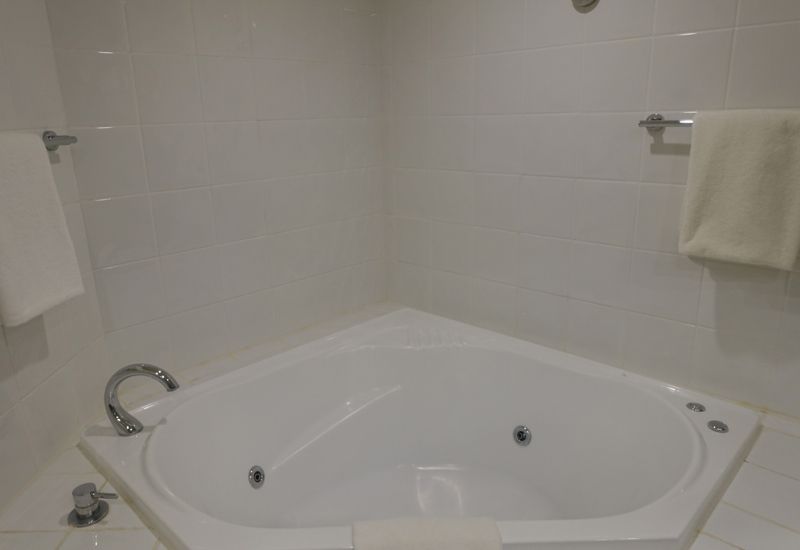 In fact, during our stay during the rain and wind, it was a good thing we had this indoor jacuzzi tub rather than an outdoor jacuzzi such as in the Imperial Suite, as that wouldn't have been usable in the storm conditions. The kitchen area had a dining room table which we took advantage of when ordering room service, and there were plates, utensils, cups, and wine glasses in the cupboard. It was also handy to have the fridge and microwave for storing and preparing some snacks and leftovers. 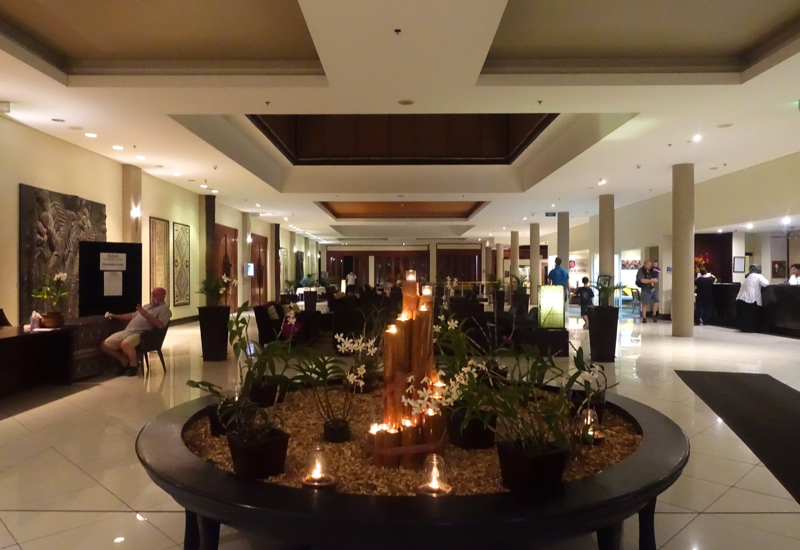 I'll cover the Sofitel Fiji Resort's restaurant and dining options in a future post. 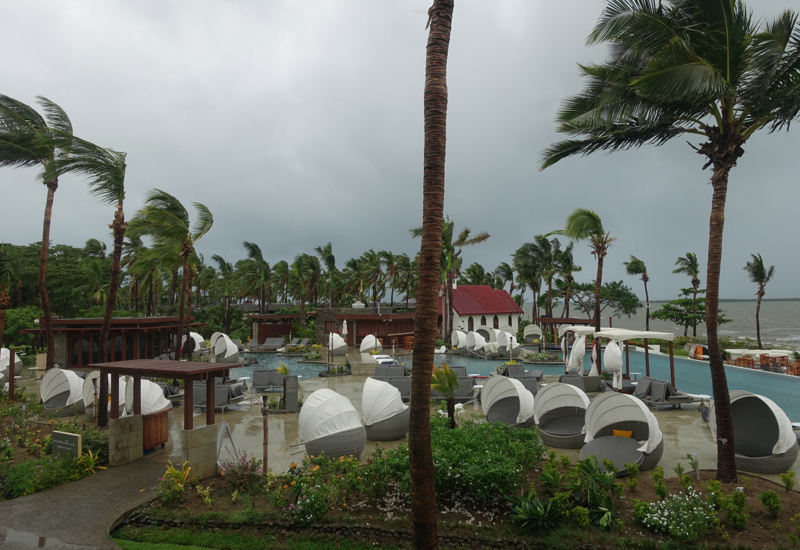 Clearly this resort isn't what we came to Fiji for, but we ended up being very grateful that we chose it over other ones near Nadi for our stay, because the storm took out the power and apparently only the Sofitel Fiji has its own backup generator. 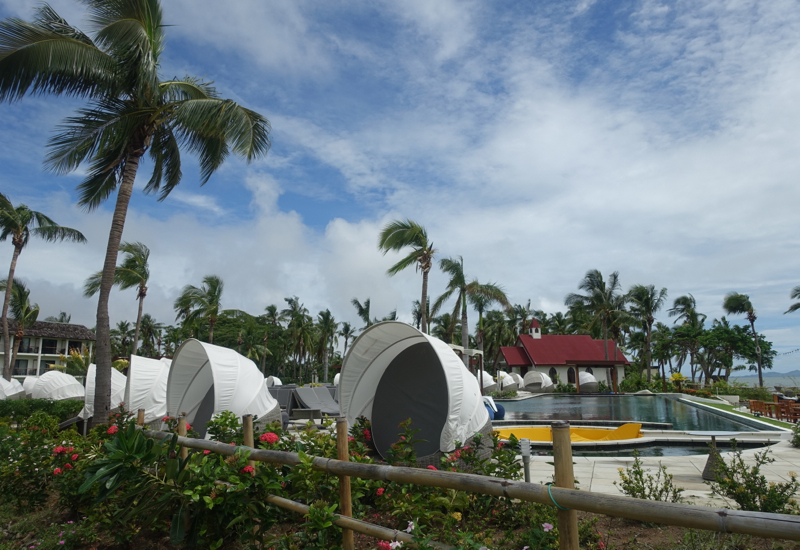 So while we did have some WiFi outtages, we were very fortunate compared to guests at other resorts who had no power–so no hot water, air conditioning, TV, power for their devices, etc. 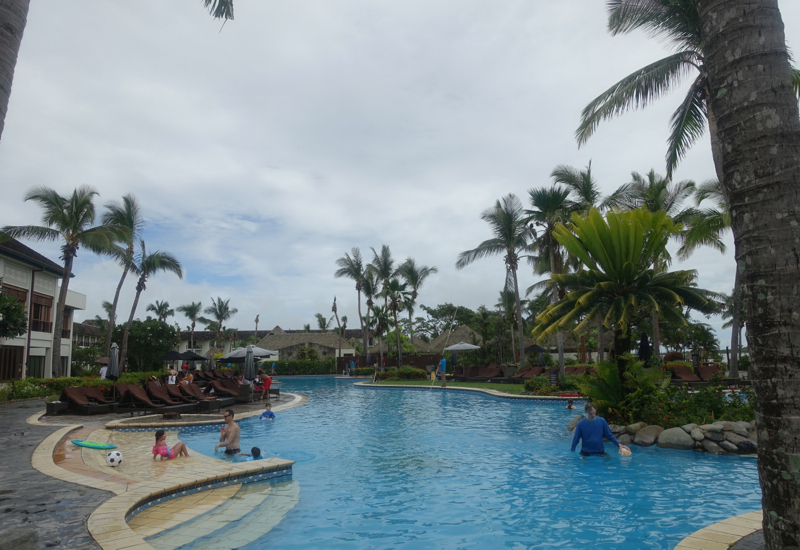 I'm sure if we'd been there during great weather and been able to enjoy clear skies, the Waitui Beach Club, and the offsite diving and snorkeling trip we'd originally planned we'd have had a nice experience. Not Laucala nice, of course, but these resorts don't compete with each other. The storm made it a trying time for everyone, so in addition to having power, we appreciated how hard the staff worked during a full occupancy situation to try to keep guests happy, even though they themselves were in many cases stranded at the resort, unable to get back to their families due to the roads being flooded. Given the time we spent indoors, I was very glad we had the space of an Opera Suite, even though it was very plain. And thanks to the very comfortable bed we slept very well. 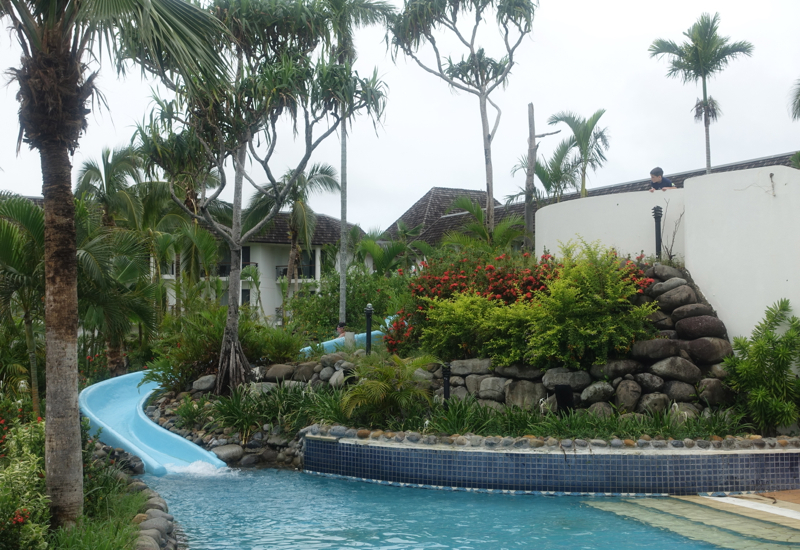 If you've stayed at the Sofitel Fiji Resort & Spa, what was your experience? Become a TravelSort Client and Book your luxury hotel with Virtuoso or Preferred Partner Amenities!